I don’t mean people who steal birds. I mean birds who steal, sometimes from people. 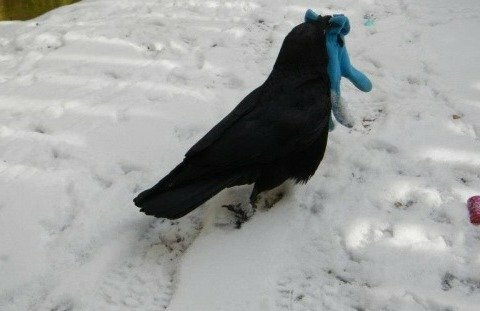 It’s a sad fact of life: sometimes birds take things that don’t belong to them. Raptors mug each other mid-air. Bowerbirds steal each other’s nest decorations. Stellar’s Jays take acorns from Clark’s Nutcrackers. Gulls grab french fries from tourists, and occasionally descend into shoplifting. 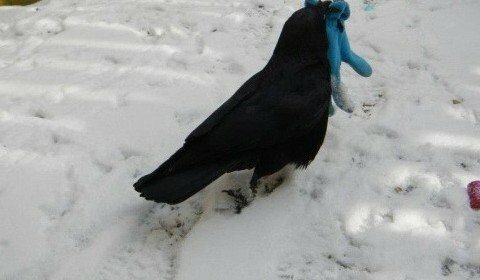 Crows, who are probably the most larcenous birds on earth, make off with anything they can get their beaks on. The crow in the photograph above is unreleasable and lives at Teatown Lake Reservation in New York. She is hurrying away with the glove she stole from Lisa Kelly, who had innocently entered her enclosure with food and cleaning supplies. The same crow lay in wait for Lisa’s colleague Erin Smithies-Baker, then expertly pickpocketed Erin’s debit card. Evidently, it was not easy to get the card back. “I think she was aiming to buy herself some jewelry,” said Erin. Many rehabbers raise several crows together and release them on site. The crows are not friendly to humans, although they sometimes make an exception for the person who raised them. 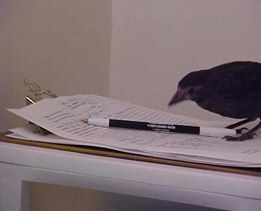 Jodi Swenson of Massachusett’s Cape Ann Wildlife Inc. released a crow named Odin, who occasionally still appears at her open window. “I’d check my bank statements anyway,” cracked Michele Wellard, of Pennsylvania’s Schuylkill Center Wildlife Rehabilitation Clinic, during one of our frequent Rehabber FaceBook Free-For-Alls. Hats are a big draw. Eileen Wicker of Raptor Rehabilitation of Kentucky has an unreleasable Turkey Vulture who has a thing for hats. He doesn’t care about gloves, scarves, or other accessories – just hats. The escapee Rainbow Lorikeet that adopted my sister takes the blue mouse button from my laptop keyboard. You’d think it had no chance to get it until you found it missing. Then began the house-wide search for a 5 mm rubber disc. If I were a TV, I’d steal hats too. It’s cold out there this winter, especially for the bald among us! Unsurprisingly, I’ve found frigatebirds to be rather tone to this. Lost a hat them once. Oh, Marj, I can relate! I had an African Grey once who was a terrible thief, and then he’s chew whatever he’d stolen too bits. Meredith, that’s a really good point! I’ll have to ask Eileen if her TV ever tried to put it on. And Duncan – a frigatebird! Do tel!! No problem, Jodi, all fixed and with new link. ady 9 months later buried in the dirt. Mystery solved. Bluebell stole pens, pencils and paint brushes from your hand among many other things. That’s so funny, Laura, you were pick pocketed as well. And Arden, it’ll probably happen to you someday when you’re filling up your feeders. Leave the car keys inside …. I love these stories, Suzie. It’s like you’re writing “the lighter side of wildlife rehabbing.” It’s also nice to see the camaraderie y’all share. Thanks, Donna! We take our laughs when we can get them. And I do love my tribe – my favorite (and most understanding) people!